Drama. National Doughnut Day is coming up (click on June 7 below) and the markets are taking an early coffee-break, waiting for some new anxiety to spin their tales. However, we’re always on the look-out for an honest buck regardless of the “markets” and thought that we, too, should check out the coffee & donuts that fuel the early mornings and overtime of working America. 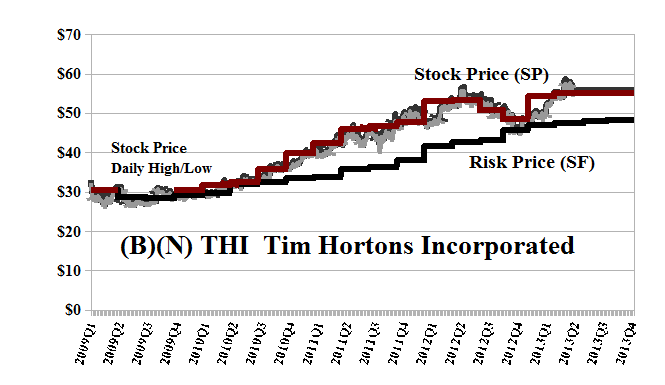 They’ve all been in the Perpetual Bond™ for years (please see the Exhibits below, Red Line Stock Price (SP) above the Black Line Risk Price (SF), and for no other reason) and our headliner is the smallest of the three (including Dunkin’ Donuts and Tim Hortons which are of a similar size) and it grew much faster than its customers this year, and much, much faster than its friends in the same business. 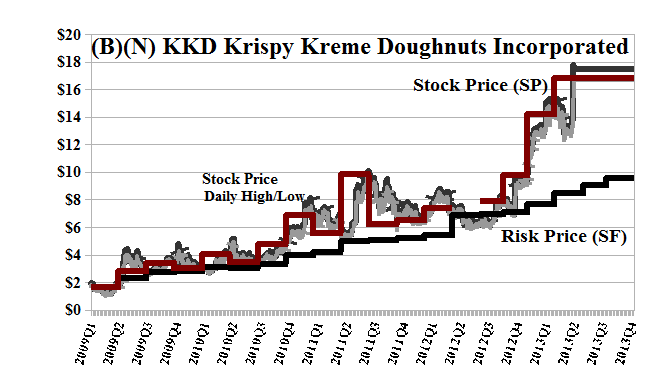 Most analysts will say that it’s because the earnings growth (EPS) was good quarter-after-quarter in 2012 and as expected (The Street, May 29, 2013, Great Donut Debate Hits Delicious Dilemma). But that doesn’t explain anything about the extraordinarily “crispy” stock price – from $6 to $18 and a $300 million company to a $1 billion company in less than a year- or how the alleged “earnings” growth is going to support that price in the future, or shall companies forever live hand-to-mouth, quarter-to-quarter, on the expectations of analysts and pundits? And, of course, Krispy has been in business for more than 70 years – where’s the surprise? Please see Exhibit 1 below. It should be obvious that the stock price will go up only if there are more buyers than sellers (usually money-wise but it could be effected by the relative numbers of buyers and sellers if there’s money somewhere), and down otherwise – all stock prices begin and end at zero – and a “numerate motivation” is only one of many factors and P/Es and EPSs get at most a glancing look because they don’t foretell the future, or even next week, and there’s no special content to move markets other than a simple fact culled from the past and a wink and a nod from some analysts. It’s the tail and it doesn’t wag the dog. In the case of Krispy Kreme, which only has a market capitalization of $1.1 billion at the current $17, there are less than twenty institutions that own 50% of the stock, in total, and only eight that own a quarter of it; and then there are two private investors that each own 10% or more than 6 million shares each. So, who is buying the coffee, today, so to speak, and from whom shall they buy it? Small investors, and mom & pop, who might be impressed by the market pundits, P/Es and all that, and their own opinion, get only the market price; the institutions, however, need to know who has them in millions of shares, and they’ll work something out. The problem, of course, is who will buy them from them? And that’s where you come in Mr. Analyst, Mr. Pundit, and Mr. Tout. Krispy Kreme Doughnuts Incorporated is a branded retailer and wholesaler of doughnuts, complementary beverages and treats and packaged sweets. The Company’s shops are operated under the trademark doughnuts such as Krispy Kreme and Original Glazed. From the Company: The company owns and franchises Krispy Kreme stores and as of February 3, 2013, operated 97 company shops, 142 domestic franchise stores, and 509 international franchise shops. It also produces doughnut mixes and doughnut-making equipment. The company was founded in 1937 in Winston-Salem, North Carolina, and currently has 2,800 employees. 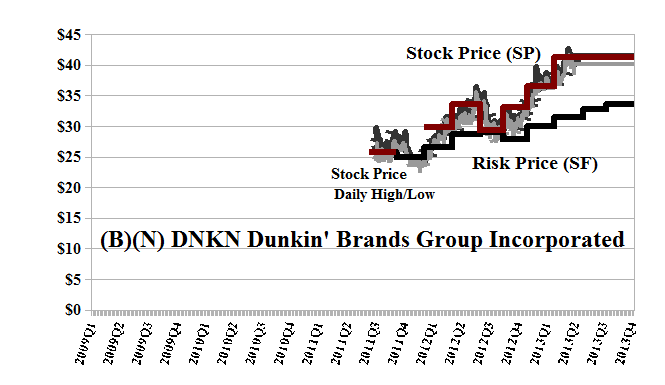 Dunkin Brands Group Holdings Incorporated is in the business of franchisor of quick service restaurants serving hot and cold coffee and baked goods, as well as hard serve ice cream. The Tim Hortons Incorporated business is to develop and franchise quick-service restaurants that serve food, including coffee, other hot and cold beverages, baked goods, sandwiches, soups and other foods products.